Planning your kid’s party can be a stressful and it shouldn't be. At Kids Parties Dublin, we take the stress & hassle away so you can enjoy your child’s special day. Children can enjoy an alternative to the usual run-of-the-mill children's party as Kids Parties Dublin host personalised themed parties to suit every age group. Only one party is on at any given time allowing parents time to relax, knowing exactly where their children and their guests are and knowing they are supervised at all times. 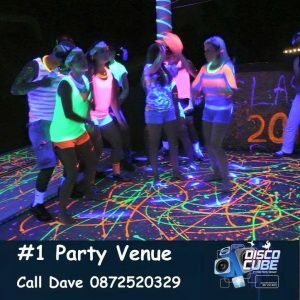 Our Disco Cube venue in Shankill, Co. Dublin is a purpose built to entertain the children with lots of music and fun and games. Kids Parties Dublin can provide everything you need to keep the kids entertained. All the kids love our bouncy castles and a special favourite is our Disco Dome. The girls all love our Princess Parties and Princess Bouncy Castle. The older girls like to choose the Pamper and Glamour Parties and Photo Booths. The boys will love our Human Foosball party.